Challenge yourself against the best surf athletes from around New Zealand and beyond, all chasing the biggest prize purse in the sport. Enter as an individual or as a team and get your foot on the start line! The Mount Monster will start at 10am on December 15. Starting in the soft white sand of Mount Maunganui's famed Main Beach, runners head south down the picturesque coast, past Moturiki Island and Castle Rock and all the way to Tay Street before starting the return trip back to the arch. The second leg starts with a run from the arch way out to the end of Moturiki Island. Competitors then leap into the surf from a 5m-high point at the blowhole to start the swim back to shore, before completing a reverse M-shape course in the Main Beach arena. Athletes pick up their skis and splash into the longest leg of the Mount Monster, with the ski leg rounding North Rock, before heading south to neighbouring surf club Omanu. Hit the beach for the turn, before making your return journey back to the Main Beach. Run your board into the water and round North Rock again before heading south to round Motuotau Island. You are then on the home straight to the finish line. Ditch your board at the water's edge and sprint through the Dexion finish archway! Competitors must hold a current surf lifeguard award. Teams (Qualified team) - All team members must hold a current surf life guard award. Race with ya Mates (Unqualified team) - A team who have one or more unqualified team members. All team members will have to sign that they are competent to complete the desired leg. It will be compulsory for SKI paddlers to wear a PFD. All individual and all Team members must attend Registration Briefing Sessions, you must be on time for these briefings, no late walk ins. Competitors (all individual and team swimmers) must familiarise themselves with the rock entry at the blowhole during one of the two structured sessions listed in the event programme. Official Mount Monster Event High Visibility Vests must be worn at all times through the event. Individual Competitors are strongly recommended to start Ski leg with 2 litres fluid for hydration and take on food / gel through the race. A PFD is HIGHLY RECOMMENDED for the ski leg. Water will be available at transitions, but hydration and food intake are competitor’s responsibility to provide. 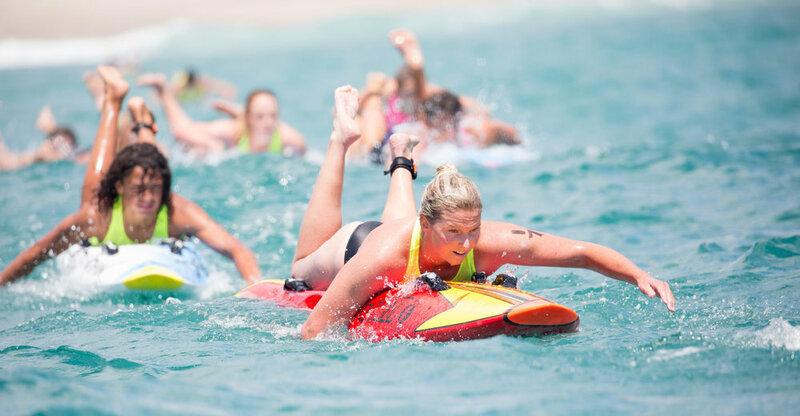 In recognition of National achievement in the 2017/2018 season, the top three place-getters in the New Zealand Surf Lifesaving Championships' open ironman and ironwoman will receive invitations to compete in the Mount Monster. Winners will receive a complimentary entry, while second place will receive a subsidised 50 percent entry and third place will receive a subsidised 25 percent entry. Also, the top open taplin teams, female and male, at the National Championships will receive one complimentary team entry for the club.